As well as being a Tourist I doubled up as a Tour guide, multi-tasking is a woman's strong point after all, haha! Anyway we started in Borough market and stumbled across the large ship which is shown a bit in the first photo, think pirates of the Caribbean ship. We then strolled along the South Bank to the globe theatre, which I found a little sad as its near my old home and I really miss living there! After that we crossed the bridge at St Paul's took in its beauty and finally ended up in Soho's Bill's for dinner which was delicious! I had the Bill's burger with bacon and it was so good, the only burgers I like are Byron's, I am really fussy with burgers and this one was a close contender to it! Overall it was a lovely day and I was sad to say goodbye to my mum and dad at the end of the night! Do you ever take time out to enjoy the city you live in rather than rushing around? Anyone know what the ship is about in Borough? 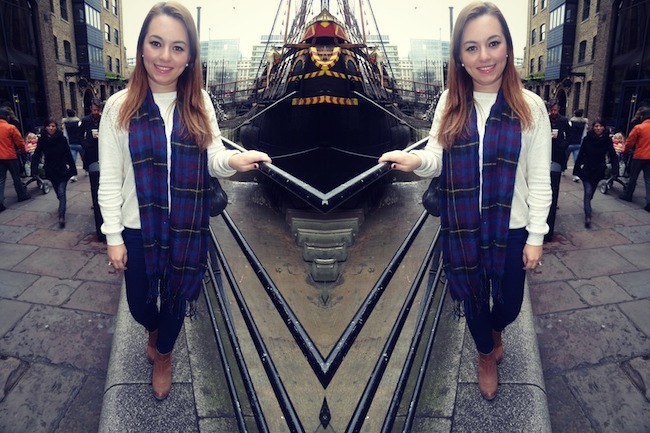 P.s Confession my whole outfit was based around the tartan scarf as it was new and I am in love with it haha sad right?! But it was a total bargain at 3.99 and it is soo soft! Also how cool is this ring? Its from this awesome up and coming designer brand they have some amazing different pieces and the quality is so good defo worth checking them out! Oh wow, that burger looks amazing, I'm jealous! That scarf is a beaut! I love the colours of the tartan! Wish I had an F21 closer to me - most of their stuffs really well priced and not bad quality!I agree - the darkness makes photographing really difficult / not as good quality! Your hair is looking so gorgeous by the way! I can't believe they haven't opened one near you yet they are popping up a lot recently! ekk i love your tartan scarf hon i can see why you planned your whole outfit around it it's so cute!! that burger looks TO DIE FOR!!! btw please pleaaaaaaaaaase tell me what foundation you use your skin always look so amaze!! I NEED that scarf but I can't find it on f21 website :( it's always the way!